Today, Father spoke of the wisdom, humility, generosity, and perseverance of the Three Kings who came from far off bearing gifts for the Christ child. He encouraged us to show our love for Christ, by bringing our own gifts forward in service to others, especially in our parish. At home, we mark Epiphany with the all important arrival of the 3 statues of the Wise Men at the manger scene. 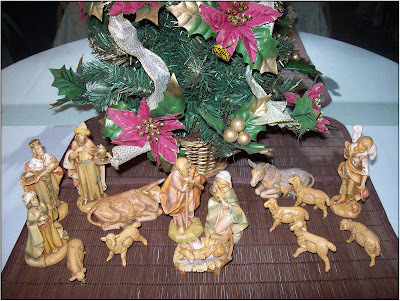 Throughout Advent & Christmas, we usually move them closer and closer - this year I forgot to do that, and today the Three Wise Men took a giant leap from the far end of the table to the heart of the manger!